Which WiFi Antenna best fits my application? One of the most important installation tips you can remember when trying to extend the range of your 802.11 WiFi network is to choose the correct type of external WiFi antenna. Although going with the highest gain will get you the farthest distance, it will also cause the most interference, and sometimes dead-spots under the antenna. Choosing between a Directional or Omni-directional radiation pattern would be the first step in successfully extending the range of your WiFi Network. Getting a bigger antenna doesn't necessary mean your WiFi will go further...but getting the correct outdoor WiFi antenna will! WiFi antenna and outdoor wireless antenna products from GNS Wireless are available in 700 MHz to 6 GHz frequencies to address many wireless LAN applications. 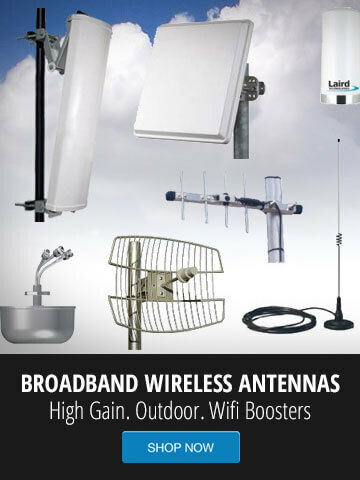 These high performance, high power WiFi antennas include a wide selection of Yagi antenna, Omni directional antenna, indoor antenna, and outdoor wireless antenna styles. Other 2.4GHz WiFi antenna types include 2.4GHz patch antenna, panel antenna, MIMO antenna, 802.11N antenna, 802.11AC antenna, high-gain antenna, DAS antenna and rubber duck antenna styles. GNS Wireless offers expert guidance in choosing the right external WiFi antenna for your specific application.